The internet is awash with information aimed at those separating or divorcing. Friends and Family may also bombard you with information, or stories of what happened when they separated. How do you decide what will be helpful and what won’t be? If you feel you need more assistance then Una Archer is a psychologist specialising in supporting children’s emotional security. She helps separated parents to protect their children from the negative impact of the separation and to resolve the emotional and behaviour issues that might have cropped up along the way. You can also follow us on Twitter. 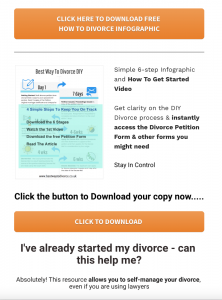 If you sign up with the pop up box on our website you will also receive regular newsletter with suggestions on how best to manage a separation and other useful tips. There is also a link below to another service called the Alternative Divorce Directory which contains useful information about processes and how to keep your separation and divorce as amicable as possible. There are Facebook groups that you can join for support through this service if you feel this would be helpful for you.